The day after the match against Dackarna, Tommy was in a bad mood. His engine had worked so badly, he planned to travel early to Stockholm that night for the Swedish World Championship round, to work on his bike on-site. He also felt unhappy because of his low number of points and the feeling that he was letting the fans down. He felt that 3,800 fans had not shown up at the track to see him collect only six points - they came out to see him win all his heats. Besides, he was also going to miss Smederna's next match after the Swedish speedway federation had decided to move a previously postponed meeting to the following Tuesday - the same day Wimbledon were scheduled to visit Leicester for a British League fixture. According to his contract, Tommy had to race in England, it was his obligation. "I have to race for Wimbledon that day, the schedule was set a long time ago. There is nothing I can do about that," he told disappointed fans in Sweden. Deep down, he was angry with SVEMO - he wanted to race as often as he could for both Wimbledon and Smederna. He wanted to become a Swedish League champion with his home-town team again. Tommy's father, Joel, the Smederna promoter, was furious with the authorities and he had threatened them with a walk-over. He felt that SVEMO should respect the fixture programme in England, not ignore it completely. On the morning of May 20, 1976 Tommy flicked through his small, black diary. During that month he'd already travelled between England and Sweden eight times. Before May was out, he was scheduled to compete in another eight meetings in the space of just 11 days, in three countries - Sweden, England and Finland. He was a little tired of all the travelling, which only felt worse when he didn't reach his potential and a dreadful night like last night didn't help. He was also tired from all the hard work he'd been doing on the bikes, which had recently led him to appoint Phil Pratt as his new engine tuner in England. Misbehaving engines, many long trips, only a few off nights . . . but all that didn't matter much when he could spend time with his beloved girlfriend Lotta. In her company he could easily forget all the hassles. She made him smile and when he spent time with her he felt happy and convinced that his future would be with her. In her mother's beautiful garden, filled with a strong scent of flowers and in the shadow of cherry trees, he felt it was time to talk about South Africa. "Next winter I plan to go not to Australia, but to South Africa instead. Would you consider accompanying me?" She smiled and thought to herself that if he'd have asked her to follow him to the moon, she would have said yes. "Of course I want to join you on that trip!" she said. Tommy laughed and made jokes about how smart Lotta's mother's husband had made his leathers look - he had taken care of them after last night's meeting. His race suit was hung outside to dry and Tommy remarked that Lotta would be seeing a lot more of this cleaning up operation in the future. Tommy and Lotta were sitting there together in the sun, dreaming about moving in together in a house in England. "But, Lotta, you know . . . hmm . . . going to South Africa without being married . . . well, that might look odd. You know, it's different over there and . . . " Tommy didn't have the courage at that moment to push the conversation any further forward than that. He changed the subject. Lotta complained about all the weeks she still had left to work in school. She liked the time she spent as an intern at a nursing home in the village of Flen, were she was working at the time and where she was going that same night. They were both looking forward to England and a life together. Lotta couldn't wait, while Tommy had even written it up in his diary. His entry for June 4, 1976 read: 'Lotta finishes in school.' Lotta was sitting in the backyard of her mother's house and felt a happiness she had never felt in her whole life. When Tommy had said goodbye she ran in to her mother and yelled excitedly to her about Tommy's words about going to South Africa and them not being married. "What do you think he meant by saying that . . . do you think he wants to marry me?" During his whole speedway career Lars Jansson was famous for nothing more than being Bengt's brother - just as Bosse was widely known as 'Tommy Jansson's brother'. Benga's brother was two years younger than him, not as skilled on the track and nowhere near as successful as the Swedish star and former World No.2 who remains a legend among supporters of Hackney Hawks. Lars, 32-years-old, was riding for the Valsarna team from Hagfors, in the Swedish second division. At that level he was one of the stars and on his good days he could challenge the very best. It was an uncle of the Jansson brothers who had got Bengt and Lars interested in speedway to begin with, when he'd taken the boys with him to meetings in Stockholm. Lars liked to work with the bikes as much as the racing itself. Bengt showed early on that he was the best rider of the two of them and, from 1963 onwards, Bengt was always in a different class to his younger brother. Lars' best result was fourth place in a Swedish Final. Every time he raced he did so with one thing in mind - to show that he was more than just 'Bengt's brother.' The 1976 season had started brilliantly for him when he won a qualifying round of the World Championship in Malilla with a maximum 15 points. He had beaten many world class riders that night, including Bo Wirebrand and World Finalist Tommy Johansson. King's Lynn newcomer Richard Hellsen and a young Jan Andersson, who'd made his BL debut for Swindon Robins the previous season, were also in the line-up. Now it was time for the next stage of qualification en route to the World Final - in Lars' home city of Stockholm. The Gubbangen track was very familiar to Lars, who was going to have brother Bengt for company on track. Lars felt that this was a perfect opportunity for him to show what he was made of. 'I have everything to win, nothing to lose,' he thought during his trip to Stockholm. "How the hell are we going to make it without Tommy?" Cyril Maidment was worried. Tonight's BL match at Sheffield Tigers was not an easy one, especially without their top rider. Cyril had strongly opposed the ban on commuting foreigners two years earlier and he praised his Swedish import every chance he got. Many times, when critics and fans had doubted the practicalities and loyalty of riders dividing their league commitments between two countries at the same time, he reminded them that Tommy "always showed 100 percent commitment to both Wimbledon and Smederna." The most important argument for Tommy and the other imports, according to Cyril, was that their presence - even though they were expensive due to their travel bills - made the English riders better. Just the chance of competing against the best riders in the world, week in and week out, made the young British riders develop faster. Cyril never wavered from that opinion. But now he had other things on his mind. Sheffield Tigers away. Without Tommy. In desperation, the Dons' team boss had hunted high and low for a guest rider replacement before finally getting Hackney No.1 Dave Morton to fill Tommy's place at Owlerton - one of Mort's favourite tracks and relatively close to his Manchester base. When Morton agreed, Cyril felt relieved and said: "This might turn out to be a great night after all." Anders Michanek and Bernt Persson had started to acknowledge each other again. Bernt would never accept Anders' apologies for the crash in the Swedish Final of 1973 but, as time went by, Bernt had to get back to being normal towards his former best friend. Time had to heal all wounds, he decided. Injuries and all the travelling had taken its toll on Bernt, who was also falling out of love with his beloved Cradley Heath. A few weeks before the individual round at Gubbangen Bernt had cancelled his contract with Cradley and decided he was just going to race in Sweden from now on. On his day, Bernt could still beat the best riders in the world - indeed, to get to Gubbangen he'd won the previous round in Kumla with a maximum. Tommy had also qualified for Gubbangen with a maximum in Lindesberg on May 9, when he led Hans Holmqvist and Christer Sjosten onto the rostrum. Anders Michanek could also beat the best when he produced his top form. But he was 33-years-old - three years older than Bernt. Not even Anders had the same consistency or hunger for success any more. Of the 16 riders competing at Gubbangen, nine were going to reach the next stage - the Nordic Final at Norrkoping, Sweden on June 2. Both Anders and Bernt counted on making it. If there was any rider the two veterans feared, it was Tommy Jansson. Bernt and Anders both agreed on one thing: "Tommy Jansson is a future World Champion." Inga-Lill Jansson was supposed to go with the rest of the family to Stockholm that night but, because she had to work late, she stayed at home. When she returned home to the apartment she found all Tommy's bags in his room. He was booked to travel back to England the day after and he'd said that maybe he'd spend the night at Bengt Jansson's house, in Taby, outside of Stockholm, and catch the morning flight from there. 'Okay, this means that now he's coming home tonight instead,' Inga-Lill thought to herself. The whole family was in Stockholm, except her. Inga-Lill planned for a night on her own. She had ordered pizza and was going to watch the TV series, Heirs, that she had started to follow with interest. Bosse Jansson had started to establish himself as a top rider in Sweden. He had missed the last match against Dackarna because of a fracture to his right hand, an injury he'd tried to keep a secret from his father. Bosse hurt himself when he'd played football for fun with some friends. The day before the match against Dackarna, he had made a doctor remove his plaster cast, but the doctor had ordered Bosse to sign a paper accepting full responsibility in case he became involved in another accident. Bosse was racing at his own risk. "If my father calls you, tell him it's nothing serious, just a slight bruise," Bosse demanded. Joel wasn't stupid, he found out the truth and forced Bosse to take part in a junior event instead of the main senior match. "That's below my dignity," Bosse complained. He was furious and close to leaving the track, but Inga-Lill made him stop and think before he acted. "If you leave now, you'll never race for Smederna again," she warned him. Bosse realised it was in his best interests to listen to his parents, both of them. He had been in a lot of pain while racing, but he managed to win both his junior-heats in good race times - even faster than a few winners in the main match. Bosse felt that he belonged with the best, that he had the ability to perform at top level. In his first qualifying meeting before Gubbangen he'd ended fourth overall in the round at Kumla behind Persson, Tommy Nilsson and Soren Sjosten. The Swedish Final at Gubbangen was going to be Bosse's first big step on the international scene and he too was aiming for a place in the Nordic Final. 'Even if I'm going to cry out in pain, I'm going to make it to the Nordic Final - I want to ride against Tommy twice,' he thought. Bosse liked racing at Gubbangen, where he'd won the Swedish Junior Championship the previous year. Of course, now his opponents were of a much higher calibre but both Joel and Tommy believed that Bosse had a great chance to make it to the next stage. When Joel and Bosse arrived at the track, they met up with Tommy in the pits. He was in a great mood, having travelled to Stockholm early to tune his bike at the workshop run by Per-Lennart Ericsson - a well known super-tuner who had worked for Anders Michanek for many years. After Michanek won the World Final in 1974, he brought Per-Lennart up onto the rostrum to join in the celebrations and to acknowledge his role in his success. Per-Lennart didn't help everybody - he said no to many riders, but not to Tommy. "Now my engine is going to work great. Now I'm not going to go up on my back wheel all the time. I'm going to be so much better from the gate," Tommy said. Joel was a little sceptical. "Are you really sure it's the bike's fault that you're not better at the gate?" "I promise. Now I'm going to go straight forward, not lose time on my back-wheel," Tommy insisted. Beside Tommy in the pits, Joel noticed a couple of boxes from some of his son's sponsors - some motor-oil and engine parts. Bosse felt a little lost in the pits. "Where should I take my place?" "Wherever you want," Tommy said. Tommy's mechanic, Kenneth Swedin, made some final adjustments to Tommy's bike. It was time to start it up and Tommy went away for a quick test spin on the track. When he came back, he looked concerned and annoyed. Joel, who was going to watch the meeting from the pits, understood why. He'd seen how riders went all over the place on the bumpy track. "The track is in really bad shape. It reminds me of farmland," Tommy told Joel and Kenneth. Anders Michanek had raced at Gubbangen for many years - it was home to his Swedish team Getingarna. But he had never liked the track and had repeatedly complained about the bumpy surface. He had even been close to changing teams in Sweden, because he was sick and tired of having to race there so often. Another rider who also called Gubbangen home was Lars Jansson. He was also in a bad mood, because he'd never enjoyed racing their either. It was such a big track, where speed mattered most, and there was never any close speedway at Gubbangen. Bengt's brother preferred more technically demanding venues over the big, fast tracks where speed counted for everything. Now that the track was also in much worse condition than usual, Lars didn't have a good feeling. "Number 12, from Smederna in Eskilstuna . . . Bosse Jansson." "Number 13, from Smederna in Eskilstuna . . . Tommy Jansson." The schedule meant that Bosse was going to make his first start in the third heat of the night, with Tommy taking his opening ride in heat four. Lars Jansson wore number 15. Heat one brought the first crash of the evening - Per-Ake Gerhardsson and Tommy Johansson both went crashing into the solid, wooden fence. The red flag went up and the heat was stopped. Per-Ake had to be taken to the Sodersjuhuset hospital by ambulance because medical staff at the track were worried that he might have badly injured his back. Johansson also complained of pain in his back, although he had to wait for the ambulance to return to the track before he too could be taken to hospital for a precautionary check-up. Nobody in the pits had been surprised by the first race incident - not with the track as bumpy as it was on the night. The vastly experienced Soren Sjosten was in heat two but when he came back to the pits after his first race, he was furious. "The track is so f*****g terrible," he fumed. "This is the worst track I've ever ridden and I'm not going to continue. This is it for me tonight, I'm not racing another heat." Race three saw Bosse up against Bengt Jansson, Bosse Wirebrand and Christer Sjosten. Tommy, aware of the abysmal track conditions, walked over to his big brother and said: "Be careful out there." Bosse would never forget those words. They were the last words Tommy ever said to him. Out on the track, Bosse could just about suffer the pain in his damaged hand for one lap before he had to give up and cruise around for the rest of the heat. He reluctantly accepted that he wasn't fit enough to race again that night. He told Joel that he'd had enough and that a reserve would have to take his place for the rest of the evening. It was time for the fourth heat . . .
Tommy Jansson, wearing the No.13 racejacket on the outside of Hasse Holmqvist during the fatal World Championship round in Stockholm. In less than 60 seconds Tommy was dead. Lars Jansson knew he was an outsider in the upcoming race. 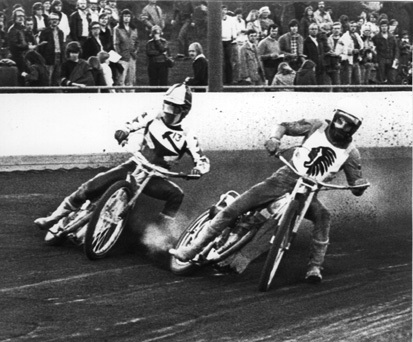 His opponents were: Tommy Jansson, Soren Karlsson (who had made his BL debut for Swindon just weeks earlier) and the vastly experienced Hans Holmqvist - all three having raced in the top division in Sweden and as professionals in England. Normally Bengt's brother would not be expected to beat any of these riders, so he knew it was going to be very tough for him. He had already been in a few battles with Holmqvist. In one race, Holmqvist had leaned so hard over Jansson in a turn - a tactic for which the former Wolverhampton and Oxford star was renowned - that his chain went right through Lars' boot and caused a nasty cut. But the rider that Lars Jansson feared most in this race was Tommy Jansson. They had raced together with Young Sweden in England in the summer of '72. Lars had been impressed then by Tommy's willingness to learn and always improve. Tommy was so serious, on and off the track, that Lars was sure, like many others, that Tommy would one day become World Champion. Lars didn't feel intimidated, though. He always managed to put aside thoughts of who he was up against and almost rode better when he was up against quality opposition. Under a lot of pressure, Lars could often raise his own game. Like in another qualifier for the Swedish Final, when Lars was chased by his own brother in one heat. Bengt was in his favourite position - he was one of the best riders in the world when it came to sneaking up from behind - and he really tried very hard against Lars. But Lars remained strong and he made it over four laps. It was a great effort and afterwards Bengt couldn't help feeling happy for his brother. Now Bengt was in the pits, wondering who he was going to cheer for. His own brother or his Smederna team-mate, Tommy? He just hoped that they were both going to make it through to the Nordic Final. Tommy made a practice start, lifting on his back wheel as he did so. He made another start and, to his great dismay, the same thing happened again. Joel stood in the pits shaking his head. 'Is it really the bike that's the problem?' he asked himself. Tommy was upset but his bike lifted again anyway. He was not supposed to start this way any more. Why didn't the bike respond to him like he wanted it to? Even so, he still felt sure of winning the heat - without machine failure, he was the most talented racer in the field and he was going to win the meeting if only he performed to his normal high standard. Tommy started off gate three. When the tapes went up, Holmqvist roared ahead, while Karlsson and Lars Jansson also made decent starts. Tommy's front wheel again lifted as he dropped the clutch - which is exactly what was not supposed to happen. He was angry, although he often performed at his best when he was fired up. He started chasing the others. He had four laps to make it and no-one doubted that he would. It was in moments like these that had made him so popular. The spectacular chases from behind, the way he passed his opponents at will and thrilled the fans. This was also what made the sport so special. It was time for some of that sheer brilliance again. More than 3,000 spectators watched Tommy and they just knew he was not going to finish last in this heat, or any other that night. Among the crowd was Tommy's Smederna team-mate, Sven-Olof Lindh. Despite Tommy's bad start, Sven-Olof was also certain that Tommy would still win the race - he'd seen it happen so many times before. Going into the third corner on the first lap, Tommy decided to ride around the outside, to pick up more speed and line himself up perfectly to pass Lars Jansson on the next straight. Describing this race to me almost three decades later, Lars said he saw only Karlsson and Holmqvist in front of him. At the same time, Lars knew that Tommy would not be content to sit in fourth place. He was also aware that Tommy could be tough and ruthless on the track, although not at all dirty. All the riders had to hold on to their bikes really tightly to avoid crashing on the bumpy circuit. All of a sudden, Lars ended up in a big hole, lost control of his bike and careered towards the fence . . . at exactly the same moment that Tommy was about to pass him on the outside. Their arms and handlebars became entangled. Lars felt they had got stuck together and at a speed of more than 60mph they were moving rapidly towards the solid, board fence. A few thoughts raced through Lars' mind. Tommy, of course, must have had those same terrifying fears. They couldn't shake themselves or their bikes loose. It was impossible to avoid what was going to happen next. They were going to crash very badly and there was no way of avoiding the inevitable. By that time, Joel was already on his way over to where Tommy lay. Shocked fans had seen two riders slam, head-first, right in to the fence. Joel had seen the crash from the pits - as far away from the fourth corner, where it happened, as you could be. But he'd still been able to hear the sickening thud when the two riders thundered into the boards. 'This can never end well,' Joel thought to himself, as he ran across the football pitch inside the speedway track, towards the scene of the serious accident. The track doctor had rushed to attend the two fallen riders and Joel was quickly on the scene too. The only thing he could think about was that Tommy needed air, so he removed his son's mask, goggles, helmet and also unbuttoned Tommy's No.13 racejacket. The sight of the blood almost made him lurch backwards in shock, for he could clearly see that Tommy's beautiful face had been badly damaged. The ambulance had returned from its second trip to the hospital and the crew ran over to Tommy. The doctor did her best to make Tommy breath again. But he was gone. Sven-Olof Lindh was in the stands with tears in his eyes. When he saw his friend being carried away to the ambulance, he saw one of Tommy's legs fall to the side. It was at that moment that Sven-Olof knew it was over. Bosse, who had also run across the football pitch and was standing by Joel's side, didn't want to comprehend the worst. The only thing he could think about was how Tommy's beautiful face had been badly damaged. 'Poor, Tommy, he always looked so good,' a stunned Bosse remembers thinking. Joel didn't want to understand either. "Come on, drive!" he barked to the ambulance crew. "You're need to hurry - fast." As the ambulance took off, Joel and Bosse went back to the pits together and found somebody to drive them to the hospital. Joel called the race director and told him: "I'm not sure how this is going to end, but don't race a single heat more before we know for sure how Tommy is doing." Before joining his father on their way to hospital, Bosse momentarily sat down and Bernt Persson walked over to him. "Can I have a cigarette?" Bosse asked. They took one cigarette each. Now he and Bosse finished their cigarettes, clinging to the hope that Tommy was going to make it all right. Bernt mumbled to himself: 'No, no, no - not Tommy. Not Joel's kid.' Back out on the track, Bengt Jansson was by his brother's side. Lars was badly hurt, bleeding and in a lot of pain. Bengt couldn't believe it. His own brother and one of his best friends, involved in the same crash. Both were in very bad shape. "How are you?" Bengt asked Lars. Lars never lost consciousness. His jaw and nose were broken but he knew he'd been lucky. He was in severe pain and he wasn't going to race again that night, but he was okay. At least he was still alive. Nobody told Lars about Tommy's condition. Nobody in the car that took Joel and Bosse to the Sodersjukhuset hospital, in the southern part of central Stockholm, said anything during the drive there. Joel had seen bad crashes before, of course. He had attended the funerals of two riders who had died on the track. But for the sport to take his own son away from him . . . no, that just couldn't happen, he repeatedly told himself. Joel refused to give up hope and when they arrived at the hospital a glimmer of light emerged when a nurse told him and Bosse that Tommy had been taken for x-rays. "That's good, he can make it. This is the capital of Sweden, they have all the resources they need here," Bosse said. Back home in Eskilstuna, Inga-Lill was watching television, having just finished her pizza. In the background, she listened to the sports report on the radio but when the phone rang she turned the volume of the radio down. Luckily she did, because that's when they reported her son's horrific accident. At least she received the terrible news direct from her husband. "There's been an accident," Joel said. Thoughts of all Bosse's crashes through the years immediately flashed through Inga-Lill's mind. "Is it Bosse?" she asked him. "No, it's Tommy. We're at Sodersjukhuset hospital. I don't know how this is going to end. I'll call you as soon as we hear anything," Joel told his wife. Inga-Lill wanted to travel to Stockholm at once but, instead, she called a few people, including her mother, and they all promised to come over to comfort her. Lotta was at a friend's place in Flenm before starting her shift as an intern at the nursery home at 9.30pm. She had been telling her friend about her planned move to London and the trip she would be taking to South Africa with Tommy the following winter. "I've never been this happy in my whole life," an excited Lotta told her. Bosse, still wearing his speedway leathers and boots, and Joel were sitting by themselves in a waiting room at the hospital and desperate for news of Tommy's condition. The door opened, a doctor walked in and Joel stood up. "Who are you?" the doctor asked. "He is dead," the doctor said. "He was dead on arrival." Tommy had died of severe head injuries and a severed artery in his neck. Joel didn't want to understand. He started crying. Bosse didn't know what to do. He asked a nurse for a cigarette and she gave him a packet. Joel pulled himself together enough to call Inga-Lill. She grabbed the phone immediately. Joel said: "We don't have a Tommy any more." Back in the pits at Gubbangen, mechanic Kenneth Swedin had collected all of Tommy's belongings together. Anders Michanek had felt sick when he'd heard bells from a church nearby, announcing some evening ceremony. Anders suspected it was a very bad omen and he feared the worst. Hans Holmqvist had already told all the other riders that whatever news they were going to hear from the hospital, they weren't going to continue the Swedish Final qualifying round that night. "Everybody who wants to stop racing for the night, raise your hand," Hans asked. Everybody raised their hands. Bengt Jansson talked to a reporter from the Expressen newspaper, saying: "Tommy and me have been racing together in Smederna since 1973. We have been racing against each other for years in England. Tommy is the best young rider we have. He is a future World Champion." A moment later the sad news came over the speakers. "The meeting is postponed. Tommy Jansson has died." Bengt Jansson broke down and started crying. Kenneth Swedin sat down among all of Tommy's equipment while many riders started crying. A boy in the stands passed out. Kenneth looked at his blue t-shirt with the words 'Tommy Jansson Speedway' printed on it. He removed the shirt, turned it inside out and then put it back on again. He didn't want to talk to anybody - not about Tommy. He knew this was it for him, he was going to leave the sport forever. Bengt Jansson stood still, like he'd been struck by lightning. "It's unbelievable. He was so great. He was the best." Benga started crying again. When Tommy's grandmother, Maja, arrived at Inga-Lill's place, she wanted to calm her daughter and showed her some towels she had made for Tommy. They were for her grandson to take to England, to his new house where he was going to live with Lotta. "Tommy is dead," Inga-Lill said. "Why? Why?" Maja screamed as she collapsed to the floor. The radio reported the tragic news again. In Flen, Lotta was still at her friend's house, unaware of what had happened, when her friend's boyfriend came over. Lotta told him about her and Tommy's plans but the boyfriend acted very strangely at the mention of his name. Lotta left quickly to go to work and couldn't help thinking about the boyfriend's strange behaviour. He then told his girlfriend about the awful news he'd heard on the radio - the news he'd been unable to mention to Lotta just seconds before she'd left them to go to work. Lotta arrived at work, a nursing home for mentally retarded patients. One of the patients greeted her at the door and said. "There has been an accident . . . a guy has died . . . they said so on TV." Lotta didn't understand what the patient was talking about. Then her boss emerged from the TV room and confirmed the devastating truth: "Lotta, they just said on television that Tommy has died in an accident." At that monment, the front door opened and Lotta's friend and her boyfriend came in. They took care of Lotta, who was so shocked that she hardly knew what was happening around her. "It must be a mistake, it can't be true. It must be a misunderstanding," she cried. When they arrived in Eskilstuna, Lotta's mother and her husband were waiting anxiously for her outside the door to their house. That's the moment when reality struck Lotta. Tommy was never going to come back to her again. A 39-39 draw away against Sheffield Tigers, where Wimbledon's guest rider Dave Morton had collected a maximum 15 points. He had achieved the impossible, or he had done what Tommy usually did. Cyril Maidment was suitably happy. Next Tuesday the Dons had an away match against Leicester Lions and were looking forward to welcoming Tommy back into their line-up, even though Cyril knew that Wimbledon's superstar was not happy about missing a league fixture for Smederna. But he also knew how loyal Tommy was towards Wimbledon. The march up the standings had just started - and on the way back home to London Cyril called home. That's when he heard the news. "I just can't believe it's true," he said. He had been involved in speedway for more than 30 years and had seen people die on the track. He had seen some complete nutcases flirting with disaster. But most of them escaped in one piece. Tommy was in a class by himself. In many ways, Cyril had looked at the young Swede as a perfectionist, a rider who was never dirty and never took any stupid risks. Something like this just couldn't happen. Not to Tommy. On the way out from the hospital, Bosse and Joel met the parents of Per-Ake Gerhardsson, who still didn't know how badly injured their son was after his crash in the first heat, which seemed to have happened an eternity ago. It was when Bosse saw the Gerhardssons that he broke down. He sat down on the roadside and cried, while Joel tried to comfort him. Together with Kenneth Swedin and Smederna supporters' club secretary Gunnar Arnold, Bosse and Joel sat in a car for the hour-and-a-half long ride back to Eskilstuna. Nobody said anything. Not a single word. Back in the apartment at Tornerosgatan, Inga-Lill was waiting anxiously together with Bosse's wife Vivianne, other relatives and friends. The phone was ringing off the hook. Bosse, still wearing his leathers and boots from the fateful meeting, walked in to Tommy's room. He promised his parents he'd stay there overnight, but the only clothes he could borrow were Tommy's. Bosse laid down and tried to sleep in his brother's bed - but, not surprisingly, he didn't sleep a wink that night. 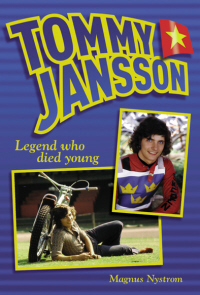 "Have just finished reading my xmas present, the excellent biography on Tommy Jansson. When you consider it was written in Swedish originally, the Wimbledon years come across with lots of local Plough Lane atmosphere and Shannon almost becomes the heroine of this segment. It was very apparent that the general consensus was that Tommy would have been world champion, and that was from his peers not just the Wimbledon supporters. My present to myself this xmas was Moggo's DVD 25 years in speedway, I have only watched the first 10 years so far, lovely old very bad recording to begin with but it does get better, particulary during the 'captain crash' sequences, and his general personality shines through. During the period I have watched, he also maintained a full time job, it's not just supporters who try to getaway early after meetings to get up in the morning for work." "A truly tragic but compelling account of events. GOD BLESS TOMMY"
"Having been unable to visit the site for a couple of weeks I had a bit of catching up to do and found I had a morbid fascination for the excellent article re the late Tommy Jansson. So sad to think of him being taken when he was only 23 and without doubt would have been World Champion. Hard to comprehend it's 30 years ago now and your article certainly did him justice as it's important that we remember those who contributed to our sport to a greater or lesser extent but ultimately gave their lives for it."